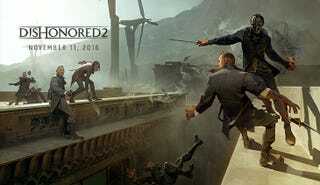 Dishonored 2, the sequel to one of the best games of last generation, will be out on November 11 everywhere, Bethesda said today. It’ll be out for PS4, Xbox One, and PC. Developed at Arkane Studios in Lyon, France, the Dishonored sequel will let you choose between two protagonists, Corvo and Emily, both returning from the first game. Bethesda first announced Dishonored 2 at E3 2015 for a spring 2016 release—it appears to have blinked back a few months. Dishonored 2 also stars on this month’s Game Informer cover, so we’ll see a PR blowout there over the next few weeks. We’ll see more of Dishonored 2 at Bethesda’s E3 press conference on June 12. It’s also likely we’ll hear about the next game from Arkane’s other studio, Arkane Austin, which was originally a Prey 2 reboot but may very well be called something else by now. That game, which is code-named Danielle, was originally pitched as a spiritual successor to System Shock 2.